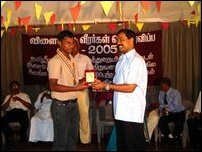 Youths from NorthEast who were successful in sports events in Sri Lanka wide competitions were felicitated in an event held at the Thuyavan Instititue of Politics in Kilinochchi 10 a.m. Tuesday, sources said. 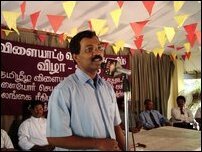 "Our movement's and our Leader's national priority is to setup structures and an environment that nurture educational and sporting talent of our youth," said S P Thamilchelvan speaking at the event. 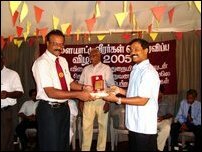 Head of Thamileelam sports M Pathmanathan presided the event. 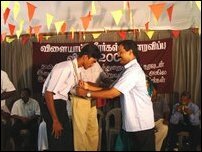 Thamilchelvan hoisted the Thamileelam flag at the start of the event. "We cannot honestly say that we have fully succeeded yet in providing everything necessary for the growth of our youth in education and sports. 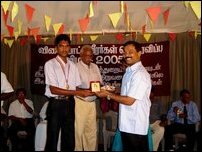 But it is our utmost desire and we will continue to work hard to improve the situation," Thamilchelvan said. "The climate of war will not deter us in this mission. 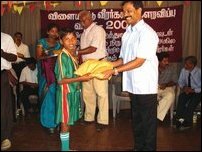 We should all work hard to ensure that the youths develop their talent to shine in world competitions," Thamilchelvan added. 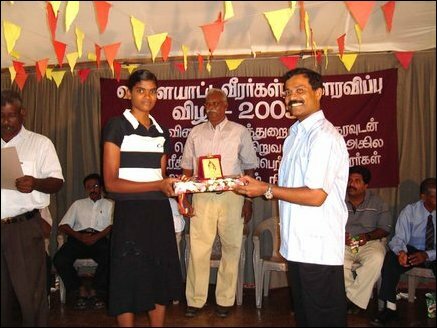 Thamilchelvan awarded prizes and certificates to winners and their trainers.